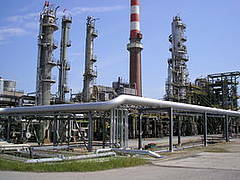 The technically well-maintained plant with a capacity of approx 90,000 barrels per day is still being operated at the moment by BayernOil at the Bavarian traditional refinery area of Ingolstadt and is anticipated to be closed in Summer of 2008. The shut down is due to economic considerations and will go along with a proposed extension of another refinery site, being operated by BayernOil as well. LOHRMANN will dismantle, pack and crate the plant under their exclusive control and transport it to the Danube port of Kelheim, which is 30 km away from the refinery. At the moment, the extensive planning and engineering operations for this Herculean task are on their way. More than 50,000 tons of equipment will be loaded onto barges at the Danube port. The dismantled component parts, piping and process plants will be distributed to more than 3,000 sea containers and dozens of heavy-duty cargo containers. Starting at the domestic port, the goods will be shipped via the Main-Danube-Canal and Rhine River to Rotterdam, there repacked onto open-sea freighters, going through the Suez-Canal until they reach the Indian north-eastern coast (Province of East-Bengal), close to Calcutta. There the transfer to the new owners, a New Delhi based Energy Group, will take place. The rebuilding at the new location will be done by their own personnel and will be supervised by LOHRMANN engineers and US-experts from Houston/US. A business delegation of the region, under the leadership of the East-Banyan Minister of Economic Affairs, recently visited the refinery in Ingolstadt/Germany. 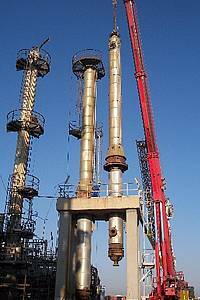 The installation of the refinery is in Haldia, near Calcutta. The settlement of service companies and subcontractors promise substantial employment and economic impulses for the region. The plant is scheduled to go into operation at the new site at the end of 2010. Another order for the extension of the Bavarian refinery complex and the necessary complementary Canadian process plants was also accepted during the last few weeks. With the acquisition of the pre-owned plant, the advantages in time as well as costs enhance the profitability of the investment and account for meeting the contemporary demands for oil products at the Indian and South-East-Asian market.